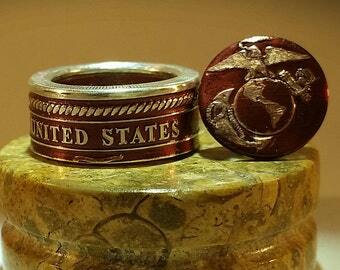 Choose either USMC or Silver Eagle cuff links in maroon, with a dark patina or plain. You can also choose button cover style or traditional cuff link style. These cuff links are made from a 3/4" center punch of silver coins. For those who don't wear french cuffs you now have an option to display attractive silver cuff links. Please note in the comments section about your choice for traditional (for French cuffs) cuff links or button cover style. International shipping is available, costs will be determined by destination. Please leave any questions in the comments section. About the silver: silver comes from dying stars, in the cataclysmic supernova explosions that sometimes marked their final demise. This is the only place where temperatures get hot enough to fuse hydrogen nuclei together to form larger atoms. Since all of earths silver was created in the explosions of supernovae, when you wear a ring made from silver, you are wearing stardust! 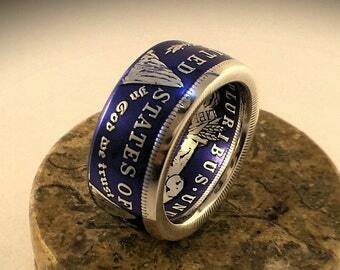 Morgan Silver Dollar Ring! Premium Series! 17 Colors! Low Profile Available! American Silver Eagle Coin Ring - SMALL SIZES AVAILABLE! U.S.M.C. Wearable Art. .999 Fine Silver Coin Ring. 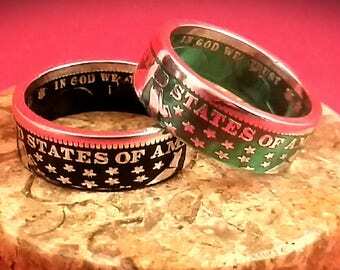 Kennedy Clad Half Dollar Coin Rings - 17 COLORS AVAILABLE! United States Army Wearable Art. .999% Silver Coin Ring - 17 Colors Available! 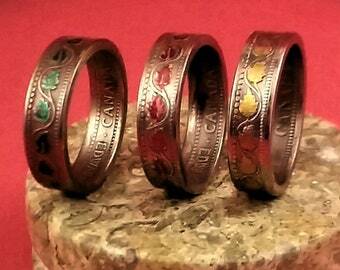 Canadian Large Cent Coin Ring - 17 COLORS AVAILABLE!!! Bracelet cuff made from 2 oz .999 silver coin! 17 colors available! Great piece and Gene happily and quickly accommodated several custom requests. Highly recommend. This is a class item. You will be proud to have it and people will admire it for both craftsmanship and uniqueness. The seller communicates well. I am compelled to share with those contemplating parting with your hard earned money for this LIBERTY COIN CUFF. BUY IT! You will be very impressed. This cuff is beautiful! I immediately cherish it. It is heavy, thick and detailed. The coin edge is authentic. The color and contrast is stunning. I just can’t get over this was made from two coins! Gene is an artist! Innovator! You will also be delighted in his presentation and communication, all first class! Nice quality ring and made exactly to my specifications. Communication with the seller was above and beyond expectations. Top quality seller that I look forward to doing business with again soon! Custom orders will be gladly accommodated. Please detail your request and if there are any questions I will contact you. 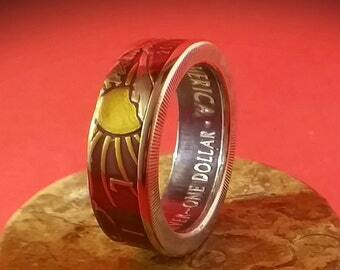 Queen Victoria Rupee Coin Ring - 17 Colors Available! 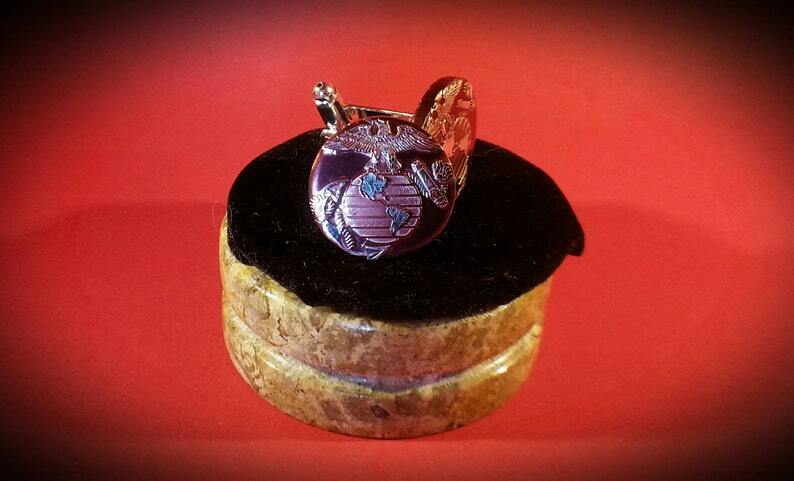 Barber Half Dollar Coin Ring - 17 Colors Available! 1893 Columbian Exposition Half Dollar Coin Ring- 17 Colors now available! 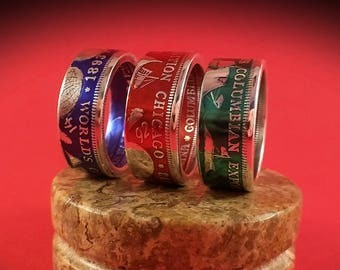 Barber Quarter Coin Ring - 17 Colors Available! State Pride Rings! U.S. State Silver Proof Quarters 90% Silver - 17 Colors Available! 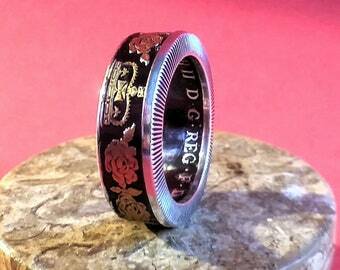 Queen Elizabeth Commemorative 99% Silver Coin Ring - 17 Colors Available!